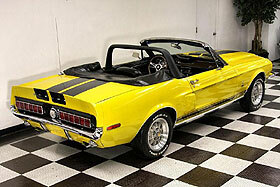 1968 FORD MUSTANG SHELBY GT 500, NEW LISTING!!!!! 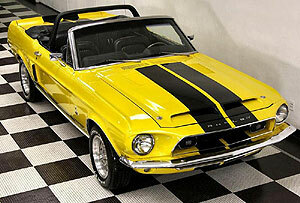 KNOCK YOUR EYES OUT OF YOUR HEAD YELLOW AND BLACK 500 GT CONVERTIBLE RECREATION!!! ((this car comes with a large binder of receipts and the build sheet)) This car is an amazing car that attracts huge attention, at a fraction of the cost of a real one. This bright yellow stallion of a Mustang is incredible. The car is was just painted bright viper yellow with deep black stripes painted over the new fiberglass Shelby hood and trunk with a Brand new black convertible top. The undercarriage is solid and intact from bumper to bumper. CHECK OUT THAT ENGINE COMPARTMENT!!! 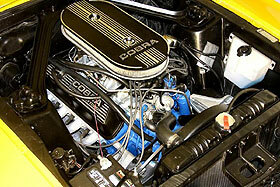 The car has a fresh 302ci engine that rock and Power Steering which is rare. The BRAND NEW black pony interior sets the car off. The dash is as beautiful as you can see by the pictures with seveal shelby features. The car is rolling on BRAND NEW correct Shelby knock off wheels and sports Shelby tail lights.